Now, there's still plenty of time to get your post up for this edition of Weekend Herb Blogging and I'll be supplying all that information at the end of this post. 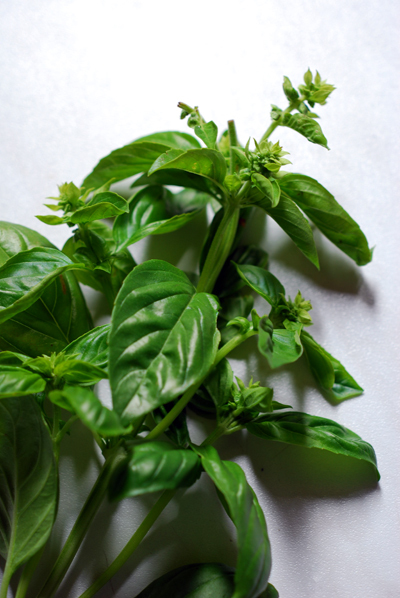 Still under the Italian influence, this week I'll be looking at that delightfully fragrant herb, Basil. Basil is a member of the mint family and is thought to have orginated in Africa and Asia, though some sources cite its home as India. Wherever it came from, it's now much loved throughout the world - its many varities finding a home in most cuisines. Basil contains Vitamins A, B6, C, K and Folate, along with Calcium, Copper, Iron, Magnesium, Manganeseum, Niacin, Phosphorus, Potassium, Riboflavin, Sodium and Zinc. It is also mildly anti-inflammatory due to the presence of Vitamin K and Beta Carotene. Tomatoes - in this case, these lovely still on the vine cherry tomatoes from Sicily. 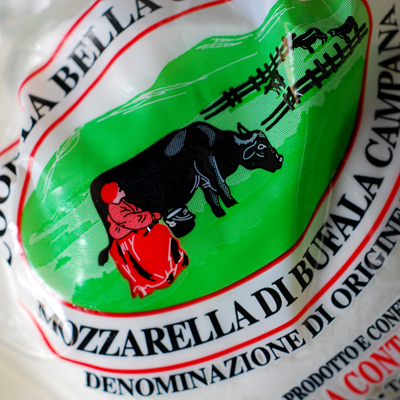 fresh Buffalo Mozzarella. Call it an side effect of going to Slow Cheese but I just can't resist indulging in these ultra fresh balls of buffalo milk Mozzarella. We do import some of these to Australia but with the amount of travel they go through, they can never be as fresh as the ones you can find here. At Slow Cheese in one of our Taste Workshops they made mention that to have them at their peak they need to be eaten within 4 hours of their making. After that, they start to degrade. 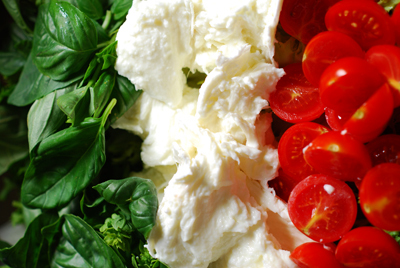 Back to the ingredients, basil, tomato and buffalo mozzarella - there is one classic Italian dish that jumps out at you with those ingredients and it is the Insalata Caprese (Caprese Salad). To make the best Caprese Sald you need the freshest ingredients and make it as close to serving time as possible. 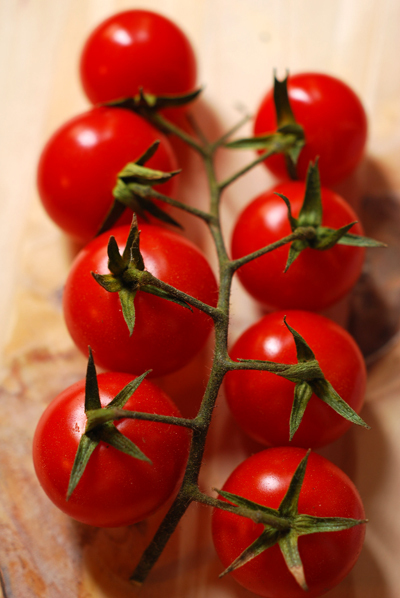 Slice the cherry tomatoes in half, if you are using larger tomatoes them either cut them into slices or small wedges. 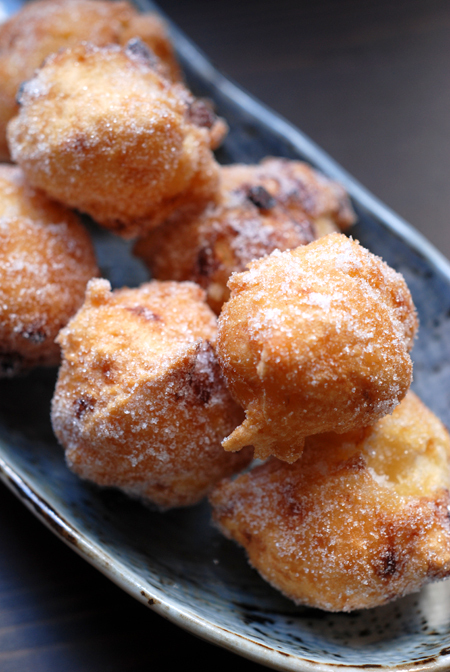 Arrange them on one side of your serving dish. Pick the freshest leaves from the basil and arrange these on the other side of your serving dish, leaving a space in the middle. Remove the buffalo mozzarella from its package and begin to tear into it - if it's fresh you should get a lovely milky liquid flowing from the tears. Place these rough shards of mozzarella into the centre of your serving dish. Place at the centre of your table and allow your guest to reassemble the salad as they serve themselves, dressing it with the extra virgin olive oil and seasoning it to taste. 3pm Sunday Utah Time, 11pm Sunday Florence Time and 7am Monday Melbourne Time. Since I don't think I'll be posting the round-up at midnight you can probably extend those hours a little. Please include a link to the announcement post and to WHB. As usual, there has been a real smorgasbord of deliciousness flowing through my mail box so please join in and add your dish to the table. very pretty blog! i luv the pictures! Oh my goodness. If it's even possible your photos are even more amazing than usual. Maybe it's the beautiful light in Italy! Love the Italian flag salad! This is one of my all time favorite dishes. I agree, it's a perfect marriage of flavors. That Italian Flag Salad shot is stellar. Well done. Haalo, wow! Your deconstructed salad is so cool, and your basil looks fabulous! Great, creative idea, and so mouthwatering. Thanks for sharing it! 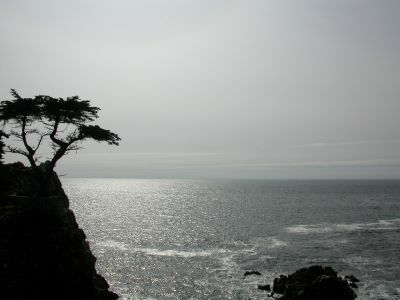 As always, your photos are simply marvelous! The colors are incredible! i love your italian flag! for me, insalata caprese embodies what i love about italian food-fresh and simple. your posts are always inspiring. Gorgeous salad! And that fresh, fresh mozzarella... worthy of Slow Cheese! Thanks Kalyn - i think it's just the romance of being in Italy, but it's impossible to take a bad picture of just wonderful produce. There are some combinations that just work and this is one of them. Thanks Sher - the colour shows the freshess of the ingredients. Hi Nabeela - I used cherry tomatoes as they just looked so good and tasted so good too. Thanks Maybahay, that is so lovely of you to say. Indeed Windy and it's also so delightly delicious! Thanks Trig - I haven't heard from any angry locals as yet ;) We're both far from home aren't we but we'll get back there soon enough and then want to leave! This may seem like a ridiculously simple thing but the first time I saw a caprese salad made with cherry tomatoes vs. large tomatoes was in Milan at a very chic restaurant (coincidentally, I think it was also deconstructed). It was so pretty and delicate and so different from what you usually see that it really struck me. It's so much better that way, isn't it? Hi Sabra - it is ridiculously simple but wow does it work. Thank you for such a thoughtfully composed round-up, Haalo. I am just salivating over all of these recipes. 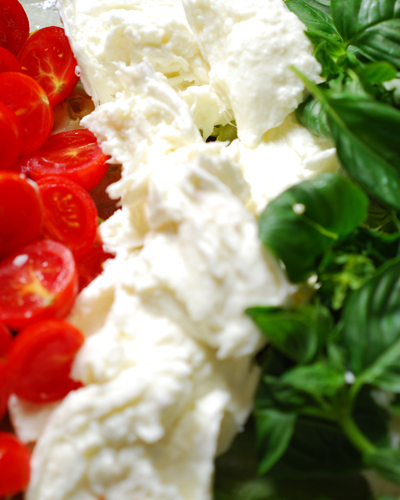 Like everyone else here, I just love your Italian flag salad--whimsical and delicious! Thanks Susan - i enjoyed putting the recap together with all those great recipes. Wow... I posted an entry to my blog on the same topic and called it Caprese Salad Deconstructed... then I found your post. Yours is a million times better and the pics are fantastic!